I’m a chocolate fan only sometimes. I like it in it’s pure chocolate bar form but am less fond of it when it’s included in desserts. Often times the chocolate dessert is rich, cloying and completely over-powering. Other times it’s made of such terrible quality chocolate that I cannot get past that first bite. I’m more of a custard person in truth. 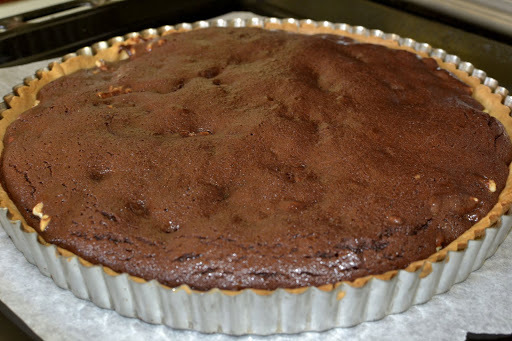 But other people love chocolate desserts and it’s hard to go wrong with a variation on the classic Chocolate Tart. 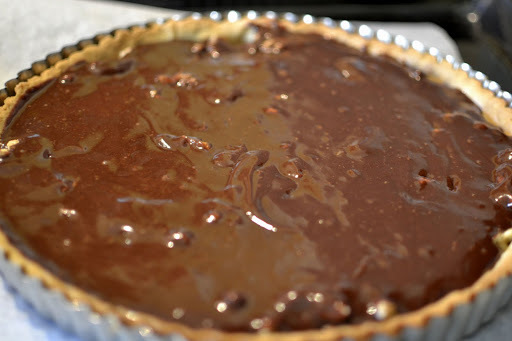 I’ve so many recipes for Chocolate Tart that it’s impossible to know which is truly best. Each chef has their own tweak to the recipe that I don’t really feel the need to settle on any specific one. This one is good for people who like the chocolate-nut combination or for those who are looking for a little something extra in their tart. This one’s less rich than some others I’ve seen but should still be served with crémé fraîche or something similar to cut through the richness. You’ll need one quantity of sweet pastry, rolled out thin enough to see the table beneath and lining a tart tin. There’s a recipe for it here. You need to rest the pastry for 20 minutes once it’s lined the tin. Preheat the oven to 180C. Remove the tart from the oven and fill it with rice, lining the tart with baking paper first. Blind bake the tart for 20 minutes. Then remove the rice and baking paper and return to the oven for a further 3-5 minutes, until the base is golden and dry. If there are any cracks in the base brush it with egg white until the crack is filled. This must be done whilst the base is hot. 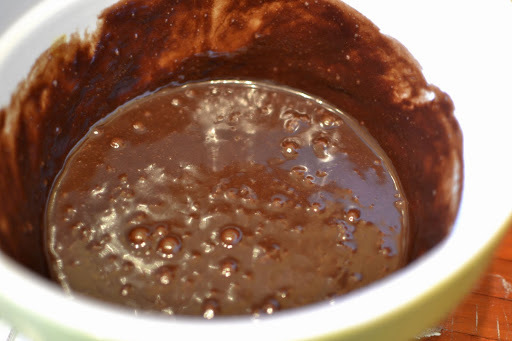 Melt the butter and chocolate together, either in the microwave (on 30 second intervals) or over a bain marie. Mix them together until smooth and allow to cool slightly. In a separate bowl whisk the sugar, eggs and vanilla until combined. Then whisk in the honey and salt. Whisk in the chocolate mixture. The mixture will thicken significantly. Place the walnuts onto the base of the tart, evenly distributed all over. Pour the chocolate mixture over the walnuts, making sure you cover the entire base. 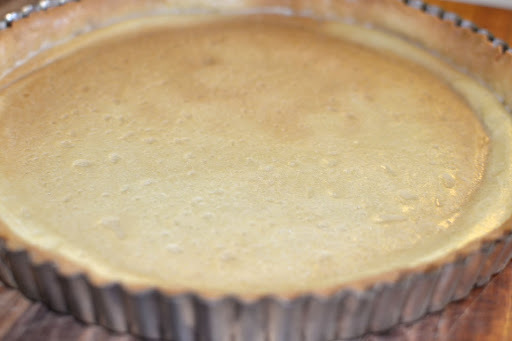 Bake for 15-20 minutes until the tart is slightly puffy at the edges and has set in the middle. Allow to cool completely before removing from the tin.